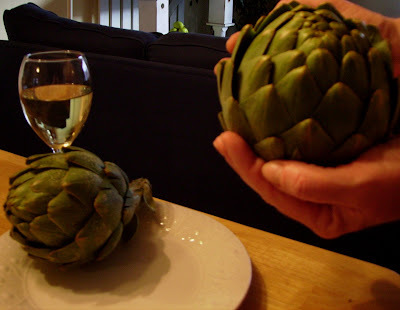 I could not believe the size of these artichokes I found at the grocery store. They are huge! They actually are larger than they look in this photo for some reason. I'll be cooking these tonight to go with my BBQ chicken and potatoes au gratin. We'll be dipping them in some roasted-garlic mayonaise I made earlier today. Yummy! Photography by my daughter, Lauren (she's a much better photographer than me). Oh how delicious! And don't they look gorgeous? They would be lovely in a bowl...: ) BUt better eaten I guess! I hope you enjoyed dinner. Have a wonderful week. Love artichokes and you aren't too far from the artichoke capital. Enjoy!.